In our last blo g post, we discussed full dentures and how they could benefit patients who’ve lost a full set of teeth to extraction or other causes. What about those of you who’ve lost only a few or some of your natural teeth, though? You don’t want to let go of the teeth you were born with just to fit a set of full dentures, but it’s also not fair for you to be deprived of a beautiful and lasting smile. Dental implants are an option, but not everyone is an appropriate candidate for the treatment, and they aren’t always the most affordable choice. Dr. Cofer and his team at Premier Family Dental here in Waco, Texas understand your frustration, and have a solution: partial dentures. You can now enjoy all the comfort and ease of dentures while still being able to enjoy and show off your natural teeth too. What could be better? 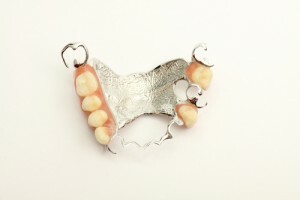 A partial denture, or bridge, usually is made of replacement teeth connected to a gum-colored base, which is connected by metal framework that holds the denture in place your mouth. Unlike full dentures, which are held in place by natural suction, a partial denture is clipped to remaining teeth. You can be assured that Dr. Cofer will create partial dentures for you that are both natural-looking and a beautiful match for your facial structure. Better yet, partial dentures have an added benefit. Not only will they fill in the spaces that are missing teeth, making your smile full and beautiful again, they’ll also keep your remaining teeth from shifting out of place, which will save you a headache from having to schedule another procedure. The team at Premier Family Dental wants to give you something to smile about. You can learn more about partial dentures and some of the other restorative treatments we offer, such as dental implants, here at our website, or you can feel free to go ahead and give us a call today to schedule an appointment. Premier Family Dental proudly serves not only the Waco area, but also Lorena, Robinson, Hewett, and surrounding towns. by: Dr. Rick Cofer at May 15, 2014 .